The animals are playing hide and seek in the forest, but Bear, the biggest one of all, cannot be found. Is Bear hurt? Is Bear sick? Where could Bear have gone? One thing is certain: his friends will do whatever it takes to find him. Told in verse and illustrated with charming animal characters, this is a great read-aloud story. I loved playing hide-and-seek as a child, and thought it would be fun to write a book where animals of the forest played my favorite game and to make up fun hiding places for them. Who wants to go play Hide and Seek? Everyone hide. Bunny don’t peek! Fox sneaks behind a fallen log. Oops, she almost sat on Frog. 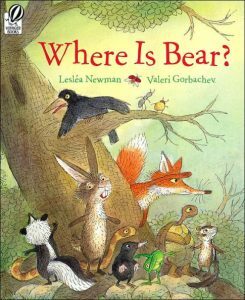 You are here: LesleaKids.com > Books for Kids & Teens > Picture Books > Where is Bear?